The 28.6 metre motor yacht Diamond Lady, listed for sale by Mack Carroll at Atlantic Yacht & Ship, has been sold with Michael Rafferty at Camper & Nicholsons introducing the buyer. Diamond Lady was built by the Taiwanese yard Horizon Yachts to a design by John Lindblom and delivered in 2005 as one of the yard’s E94 series. She features a custom interior with African cherry joinery and high gloss Carpathian elm burl inlays. The port side of the main saloon features built in cabinetry housing a 43 inch HD plasma television screen and electronic entertainment centre. The entire aft portion of this area is decorated with free standing furnishings to create a generous living room and there is a built in wet bar. Further notable features include a dining area seating eight, a gourmet galley forward, and a large aft deck. The helm station has a built in dinette on the starboard side – perfect for casual snacks while under way. Al fresco entertainment and dining is available on her flybridge featuring a custom hardtop, Jacuzzi, wet bar and a 15′ Nautica wide body tender with 60hp four-stroke Yamaha engine. Below deck there is accommodation for six guests in a three stateroom layout consisting of a full beam master suite aft, a VIP suite forward and a twin cabin to starboard, all with full en suite facilities. Powered by reliable Caterpillar 1,400hp engines, she cruises comfortably at 14 knots with an 18 knot top speed. 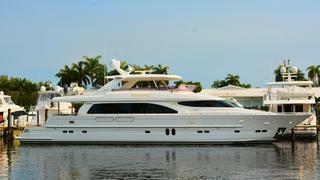 Located in Boca Raton, Florida, Diamond Lady was asking $2,999,000.